I’m playing catchup with last week’s Project Pastry Queen challenge: Tiramisu with Homemade Ladyfingers, chosen by Sarah of 20 Something Cupcakes. Homemade ladyfingers are one of those things that deserve to be on everyone’s Baking Bucket List. They’re softer, more tender, and much more flavorful with a healthy dose of vanilla. They would really make a dessert like a Charlotte shine. 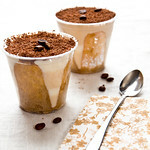 But when making tiramisu, their job really is “just” to absorb the flavors of the espresso and mascarpone fillings. Here, the store-bought, nearly flavorless cookies do just fine. But make them one, cross them off your list, and feel super, super accomplished. And then sweep up the half bag of powdered sugar you dropped on the kitchen floor. And the console yourself with a glass full of tiramisu. The recipe got “it’s good, but…” reviews from some of the other PPQ members last week. Having the advantage of listening to those reviews, I mostly abandoned the recipe for the soaking syrup and filling, opting to strip them down for a minimalist approach instead. The full recipe, in all it’s gigantic, boozy (Kahlua! Rum! More Kahlua! ), 9×13 glory is over at 20 Something Cupcakes. It’s a doozy! I stayed true to the recipe for the lady fingers and ended up with 5 dozen cookies (enough for 10 individual servings; I only used ~2 dozen for 4 servings and then froze the rest). The cookies are much softer than their store-bought counterparts so you have to be quick when dunking the cookies. Because I was assembling the cookies vertically, I found it better to only dunk the top half of the cookie, and then let the espresso slowly work its way down the entire cookie while the dessert is chilling in the fridge. This worked better than dunking the entire cookie because most of the espresso from the cookies that line the edge of the glasses ended up at the bottom after day 2 in the fridge while the half-dunked cookies were perfect. 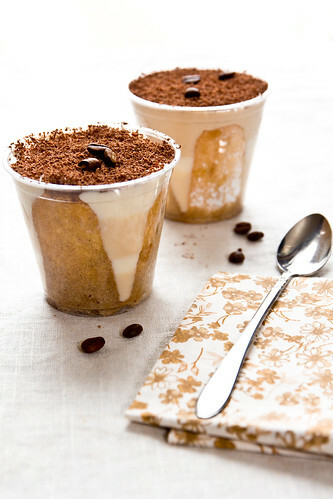 The presentation with of the individual servings, while more work, is much nicer than family-style – you can see the striated layers of mascarpone and espresso-mascarpone through the sides of the cup. And the “individual” servings are actually quite generous – and amazingly, wonderfully rich. Consider sharing them with a friend. Or not. I won’t judge. Individual servings of tiramisu with alternating espresso and mascarpone fillings. And if you want - homemade ladyfingers! In a small bowl, mix espresso and sugar, stirring until the sugar has disolved. With your mixer, cream the mascaropone, cream cheese, vanilla, and sugar on medium-high for 3-5 minutes, until light and fluffy. The mixture should feel smooth (not gritty) when rubbed between your fingers. Remove half of the mascarpone mixture and transfer it to a smaller bowl. Add 2 Tbsp of espresso and mix well. Add 2 Tbsp milk to the remaining filling and mix (this is just to thin the filling, the type of milk - whole, skim, etc - does not matter) well. Working with one ladyfinger and one serving at a time, quickly dunk the top half of the cookie into the soaking syrup and place in the plastic cup coffee-end (top) up. Repeat with 3 more lady fingers, arranging them around the cup (if your ladyfingers are thin, you might need to use more than 4). Place one of the reserved trimmed ends of the cookies into the bottom, followed by a spoonful of the espresso filling, the plain filling, and top with more ladyfinger pieces (when you run out of trimmed pieces, tear additional ladyfingers into small pieces to fit the next layer). Repeat 2 more times to fill the cup. Repeat the process for the remaining servings. Loosely cover and refrigerate for a couple of hours before serving. These sound sooo yummy! Love this idea! Home made lady fingers? Woo.. I’m impressed. This tiramisu looks great! Love the idea of individual servings! I love tiramisu! I also love presenting individual servings of desserts, as you’ve done here, though I favor using martini glasses. Would that work for this recipe, do you think? I believe it’d reduce the size of the servings a bit, but consequently increase the number of guests one could serve it to. James – Sure! You could probably stretch the filling another 2 servings that way. What beautiful photos! I don’t think I’ve ever had ladyfingers on their own, but I sure have a hankering for tiramisu now. What a clever way to make the tiramisu! If I made this again, I would skip the soaking syrup. I love your photos. I am a sucker for a really good tiramisu and this sounds REALLY good. The boozier the better! How adorable and delish are those!?! These are absolutely gorgeous! I loved the way you assembled them. And aren’t homemade ladyfingers the best?! Tiramisu is a fave fave fave! Can’t wait to try this! Oh, I love these little cups! Great way to serve. No egg in the filling, only in the lady fingers if you choose to make them yourself.